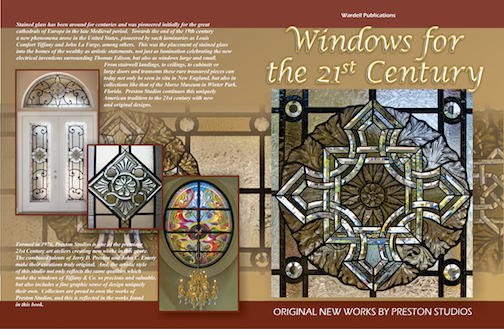 Randy and Carol Wardell will be on hand First Friday, December 2, at the Foosaner Art Museum to launch their fourth book about the works of Preston Studios by Wardell Publications: WINDOWS FOR THE 21ST CENTURY. Just as with the launch of the very first eBook in the field stained glass, LAMPS FOR THE 21ST CENTURY (back in 2012 at Timothy’s Gallery in Winter Park) this book also includes 14 embedded videos in it – some showing the studio at work on a major commission. These two books are specifically designed to make use of tablet technology. Both will be available this Friday at the Foosaner.